I must have been around 17 or 18 years old. 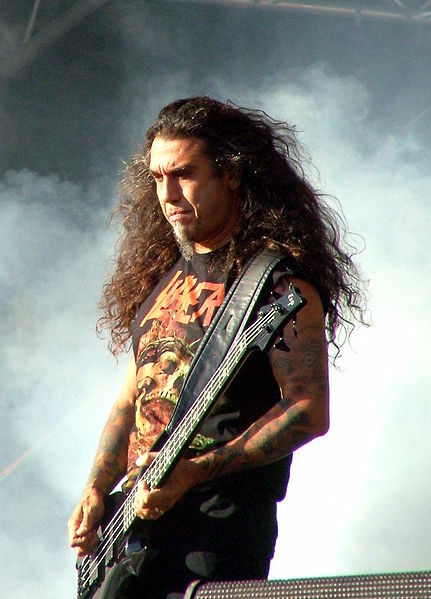 I’d put the record on the turntable, sit in the lounge room with these massive headphones on and absorb every Tom Araya scream, every riff from guitarists Hanneman and King and every warp speed drum move from Dave Lombardo. The few seconds’ space between songs was a respite from the brutal noise assault; the crackling silence as the needle ran through the record gave me a breather. I needed it. Slayer was like nothing I’d ever heard. I was raised on mid 80’s new romantic music and introduced to AC/DC, Angus and Co corrupted me but this was a whole new world. An evil world. I was in uncharted waters and loving every minute. Mum and Dad can have their Village People, I’ll take Slayer. It’s difficult to describe the sound of Slayer to someone who hasn’t heard them. If you don’t like heavy metal or even punk you’ll hate it, you don’t listen to Slayer, you survive it. It’s a demonic fusion of different genres, a perfect storm of noise. Even all these years later I put a Slayer record on and it makes me feel something, I’ve even caught myself laughing at how ridiculously fast it sounds. So, it’s with great anticipation that I purchase their new record, ‘Repentless’, released a few days ago, on September 11. They are a wounded band, Lombardo the drummer quit in a pay dispute, Jeff Hanneman, their legendary guitarist died two years ago of liver failure, after surviving a flesh eating disease from a spider bite, a very Slayer thing to do. Hanneman was responsible for writing the bands greatest songs, ‘Angel of Death’, ‘Raining Blood’ and lots more. With such a vital songwriting force and a legendary drummer gone some critics and even fans suggested in was time for the band to pack it in, why tarnish a legacy. A legacy forged with classic albums such as ‘Reign in Blood’ and ‘South of Heaven’. Ignoring all the doomsdayers the band marched on, recruited past drummer Paul Bostaph and ‘Exodus’ guitarist Gary Holt. On first listen to ‘Repentless’ I wasn’t sure the choice to march on was a good one. The last two albums ‘Christ Illusion’ and ‘World Painted Blood’ were absolute killers, some of their best work. ‘Repentless’ just didn’t seem to match up, missing was Hannemans’ punkish tempo changes and creativity. But as with some albums the more you let it breathe, it will fester away and make inroads. 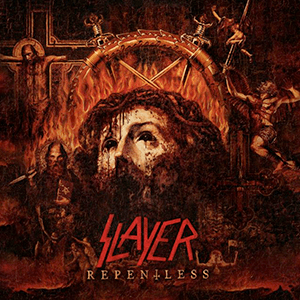 ‘Repentless’ has the all out speed metal that the band is famous for;‘take control’, ‘repentless’, ‘atrocity vendor’ and ‘you against you’ are bone crushers, also present are more groove-based tracks; ‘cast the first stone’ and ‘pride and prejudice’ are reminiscent of the ‘South of Heaven’ era. All the lyrical Slayer themes are covered, war, death, violence and serial killers. This isn’t Disney, people. If they’d cut one or two songs this could even rank amongst one of their best records. Considering what this band has been through the past two years, this is one heck of an effort. I’d love to have a listen to this record Hally, but there’s a good chance I’ll give it a miss! Lol Coolio, if you want to annoy the neighbours this one is for you.